Situated on an island in the fens Eye is first noted in Laud Manuscript in 966AD although archaeological digs around the village have shown that people have been in the area long before that with roundhouses found to the north and south of the village. Until 1541 and the dissolution under Henry VIII, the land around Eye was owned by the Peterborough Abbey (Peterborough Cathedral). To the east of the village is Car Dyke built by the Romans in the second century AD. Eyebury was a monastic manor built by the monks of Peterborough Cathedral in the 12th century. There has been a church there since at least 1543. The current church was built in 1846/47. The population in 1801 was 501, by 1901 it was 1,366 and by 2001 it was 3,779! The former fire station dating from 1828 still stands next to the Church. It was repaired by the Parish Council in 2011. Brickyard’s once stood to the north of the village with a ropeway that connected them to the Dogsthorpe Pit. The War Memorial was erected after the First World War in memory of those that died during the conflict. A small service is held there every year on Remembrance Sunday. 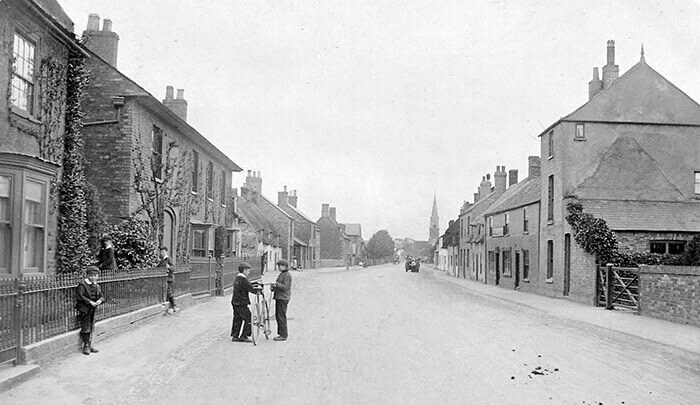 In 1947 a breach in the River Welland at Crowland caused flooding right up to the north edge of the village. Until 1972 Eye was part of Northamptonshire. The A47 bypass opened in October 1991. The front left of the photo below you can see the Manor Farm House (Now The entrance to Cleve Place and Manor Farm Community Centre). In the distance, you can see the church with a spire. The spire was removed in the 1980s due to large cracks that had appeared half way up. To the north of the village was Eye Green Railway Station which opened in 1866 (originally named Eye but was renamed Eye Green in 1875 to reduce confusion with Eye in Suffolk). The line was built to provide access to Wisbech which at the time was a thriving port town. From 1893 it was owned by the Midland and Great Northern Joint Railway whose lines covered East Anglia from Peterborough to Great Yarmouth. The last passenger train travelled the line on Saturday 28 February 1959. 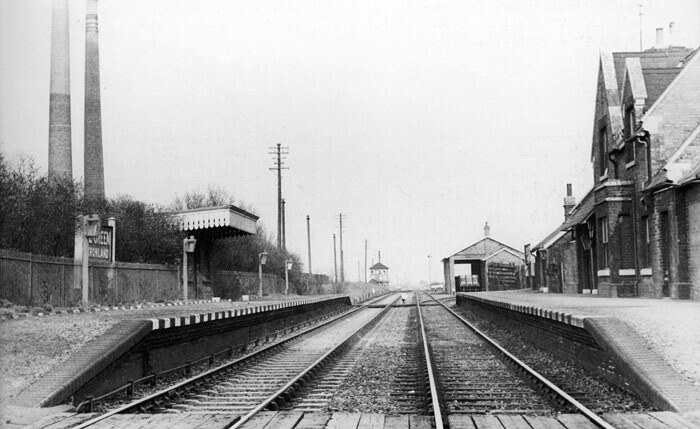 The line completely closed in 1966 and the station was later demolished to make way for the Eye bypass. The North Norfolk Railway still runs on part of the line from Holt to Sheringham in Norfolk. There have been a number of mills in the village, the first recorded was built by the monks at Eyebury. All have since been demolished but Eye Tower Mill was by far the tallest, standing at over 100ft if you include the sails. It was quite rare in having eight sails. Only seven of this type were ever built in England. Heckington Windmill in Lincolnshire is the only remaining eight sail windmill in the country that is still working. 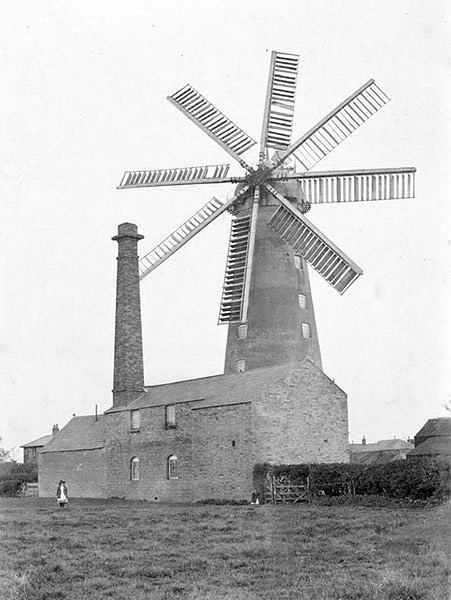 The windmill eventually became derelict and fell out of use. The Northam brickworks were just to the north of the A47 in on Crowland Road. The works operated nearly 100 years almost continuously from 1897 until 1990. Clay was dug from the nearby Northam Pit and bricks were transported around the country from sidings on the railway that was just to the south. When the clay at the Northam pit (now Eye Nature Reserve) started to run low a ropeway was built to carry clay from Star pit at Dogsthorpe. By 1990 clay reserves at the Dogsthorpe pit were starting to run low and the works were closed. 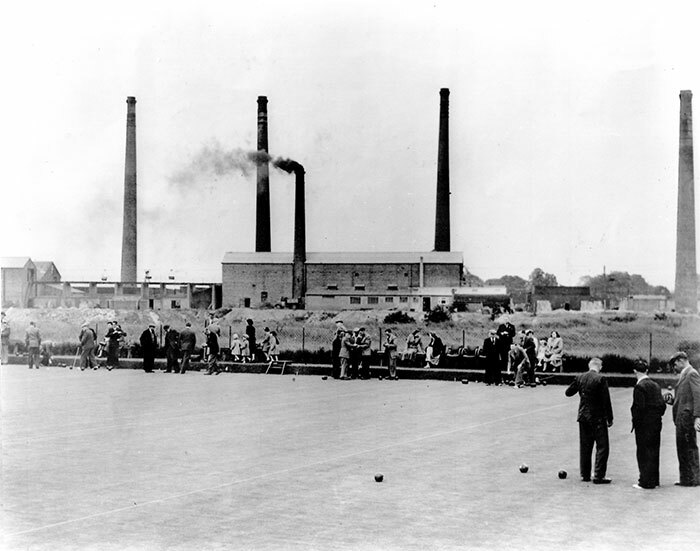 Peterborough Northern Star football team was originally formed as a village side from the two brickyards, Northam in Eye and the Star brickworks in Peterborough during the early 1900s before being renamed Eye United in the 1950s. The club was renamed Peterborough Northern Star in 2005, after its original name and still continues to play under that name from the Focus Community Centre in Dogsthorpe. If you wish to know more about the village Eye Life (1971) by the vicar at the time Philip J Randall is an excellent read.